Jonathan Foyle, an architectural historian and author, said a critical part of the restoration process will be to assess how damaged Notre Dame's massive stone vaults were by the blaze. Extreme temperatures degrees can cause calcination — a process that turns stone into powder, he said. Then, there's the possible damage caused by firefighters trying to extinguish the blaze: Dumping cold water on red hot stone can cause it to shatter and crack, Foyle said. "It's gone through a very complex trauma," he said. "You're going to need months to figure out whether it is safe enough to stay standing." Even replacing the timber roof structure that burned could be challenge. "Where do you get timber long enough?" he said. "The oak forests are gone." Foyle also worried that one of the cathedral's iconic features — a kaleidoscopic 62-foot window that was a gift from France's king in 1240 — could be lost forever. 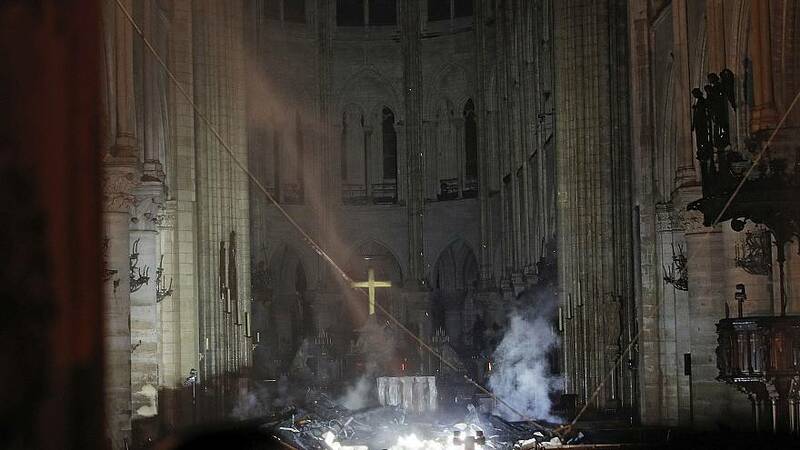 Still, he said there are French architects trained in medieval building techniques that would be up to the task of restoring this "pioneering giant of Gothic cathedrals." "This building has been through the French Revolution, the Huguenots and two world wars," he said. "I have no doubt it will rise again." 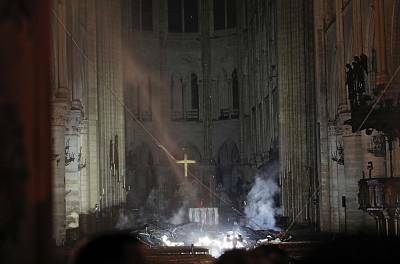 Annabelle Radcliffe-Trenner, a principal at Historic Building Architects in New Jersey, called the fire "devastating" but also believed that the cathedral could be resurrected. She pointed to massive fires at St. Bernard's Episcopal Church, a Gothic-style structure in New Jersey that she was involved in rebuilding, and Windsor Castle, the iconic royal residence in Berkshire, England, that burned in 1992. The castle's chapel was badly damaged, she said, "but it's been fully restored — which you could tell from the big wedding last year. Restoration can be done; it's just painstaking work." First, she said, the fire needs to be completely extinguished — a process that could take days. "They'll go in slowly, peeling back the damage safely and getting people to evaluate" what was lost and what can be saved. "They key is getting in very quickly to stabilize things like stained glass," she said. Any actual rebuilding will take "years and years and years," Radcliffe-Trenner said. Foyle estimated that it will cost tens of millions of dollars and require an army of stone masons, glaziers, plumbers and carpenters. Still, such a massive project could signal a "rebirth," he said. "In a way, projects like Windsor Castle — they look disastrous, and they are, but they give life to traditional trades," he said. "Sometimes they can have a silver lining."